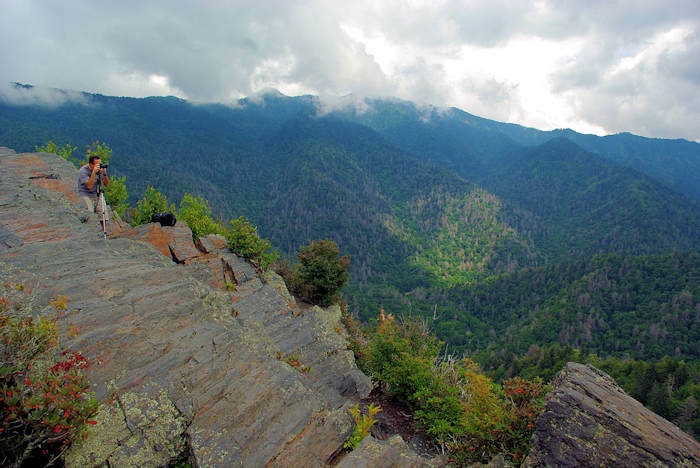 Chimney Tops is one of the most popular and rewarding hikes in the Great Smoky Mountains National Park. 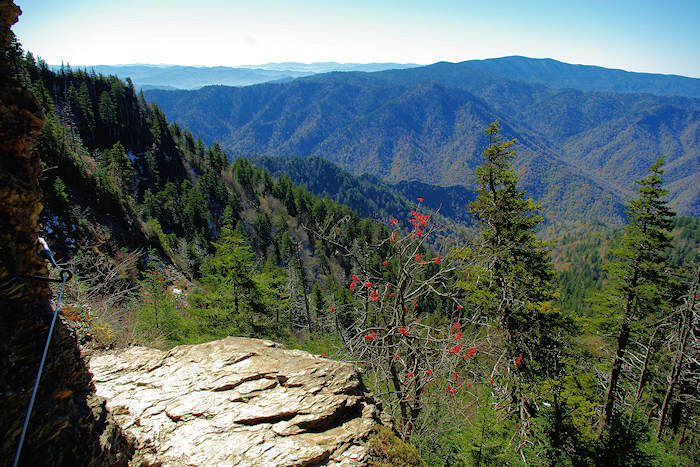 It has an elevation of 4,800 feet and is one of the park's most recognizable geological structures since it's a rare rock summit in the Smokies. You can see the twin peaks as you wind along Newfound Gap Road, but you can't appreciate them as much until you reach the top and see them again on the drive home. The mountain views at top are some of the best in the park. Update: After damage at the summit from the big wildfire in November 2016, the trail reopened October 2017. However, the final 1/4 of a mile onto the rock pinnacles will remain closed. A new observation area has been built with views of the Pinnacles and Mt. LeConte. A decision will be made next year about opening the summit again once it has stabilized. 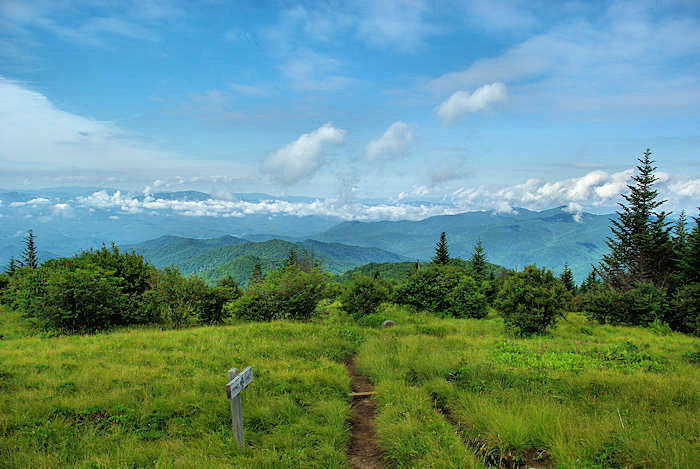 To reach the summit, take a 2-mile hiking trail (with 1,700 feet elevation gain) from the Chimney Tops Trail parking area on Newfound Gap Road (US Highway 441). Driving from Asheville, it's about seven miles past Newfound Gap. 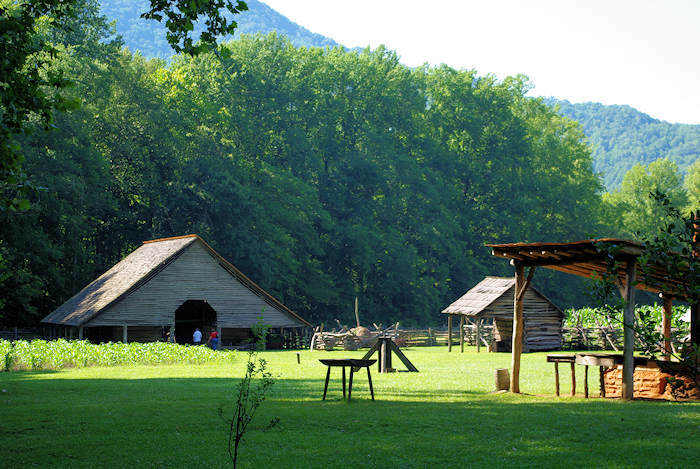 The Chimneys campground and picnic area is a few miles north (so don't go there looking for the trail). It's a strenuous uphill climb to the top (flip flops not recommended). 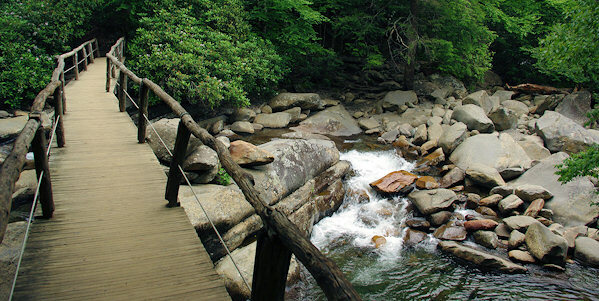 Just a short distance from the parking area, you will cross a pair of bridges over a beautiful cascading creek. This is a great spot to take a cool dip to cool off after a summer hike. Also, if you are with someone that doesn't want to hike to the top, this is a beautiful spot to enjoying the sounds of the falling waters. For the most part, the trail consists of loose rocks, which makes it easy to twist an ankle or fall, so in order to help eliminate these possibilities it is important to wear proper shoes and mind your footing. Do not attempt to climb the rocks if they are wet or icy. When you reach the rock pinnacle, the real fun begins since you will need to climb the rock outcropping to reach the prime 360-degree views. While no technical gear is needed, climbing the pinnacle is dangerous and extreme caution should be used if you choose to do so. Wear shoes with good gripping. If you are brave enough, and cautious enough, you will make it to the top with no problems (and feel great about it!). As you climb, you will find several options for small rock ledges for steps. 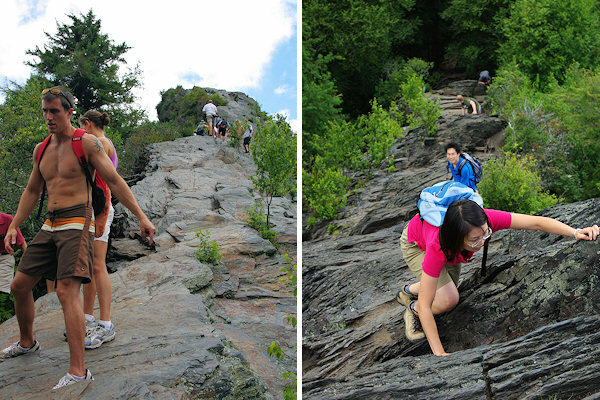 Halfway up the rock, you will encounter the steepest section - almost completely vertical. After that, climbing is a bit easy to the very top. Once on the summit, the panorama is breathtaking (or was that the climb?). This is a great place for a small picnic, so bring some snacks to enjoy on while you rest and enjoy the well-deserved view. Climbing down can be just as unnerving. Go slow, and scoot down on your rear end. No pets are allowed on this trail. 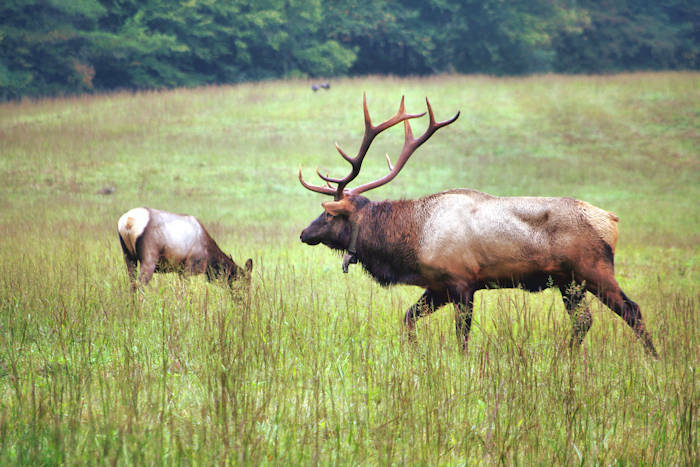 Directions: About 76 miles from downtown Asheville, allow 2.5 hours to travel. Take I-40 West to Exit 27. Follow Highway 19/23/74 for about 4 miles and exit onto Highway 19 toward Maggie Valley. About 3 miles past Maggie Valley, watch for the Blue Ridge Parkway entrance, and go south. The Parkway ends at Highway 441. Turn right to enter the Smokies. The Parkway is closed much of the winter. If the Parkway is closed, continue on Highway 19 to Cherokee and follow Highway 441 North. 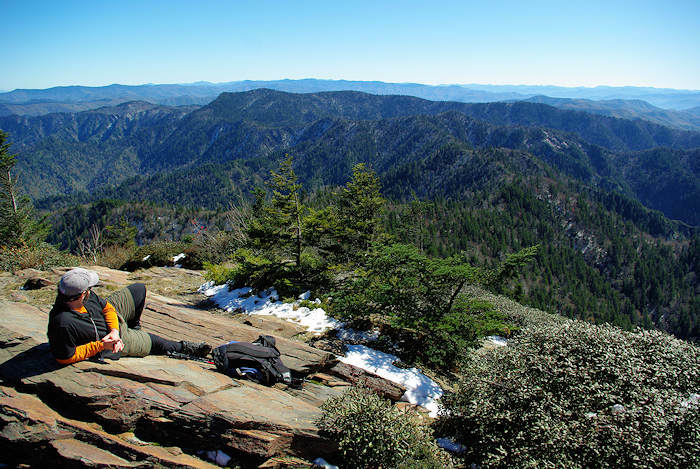 The Chimney Tops parking area is about 7 miles past Newfound Gap.